Home / Blog / IT Staffing / Your Future IT Project. Should You Hire Developers in Malta or in Ukraine? Your Future IT Project. 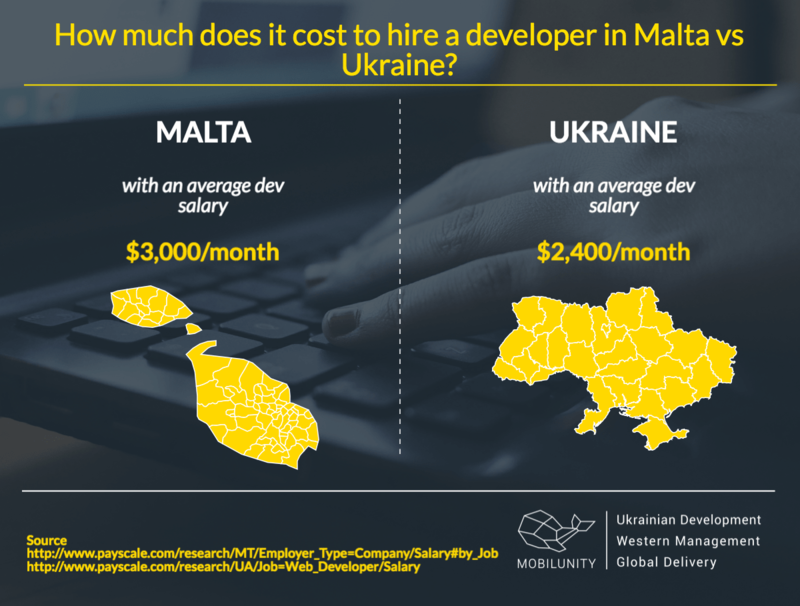 Should You Hire Developers in Malta or in Ukraine? The sphere of information technologies is gaining popularity and demand worldwide. If you are looking for IT experts, you’d be surely seeking them in the countries where the information and communication technology (ICT) industry is well-developed. Let’s take a look at Malta, a small European country in the central Mediterranean, known for its rapid IT raise since the 2013. Although Malta is the smallest member state of the European Union, it has proven to be economically stable country and the most attractive one for foreign investments. According to the Overview of the ICT Sector in Malta, IT sphere is a relatively new player in Malta’s economy. However, it has become a vital contributor to the GVA of the country at 6.9% in 2016. Its export rates have increased significantly since 2004 from EUR 46m to over EUR 200m in 2015, as it is stated in the overview. Nowadays, IT industry in Malta is represented by over 300 companies. As it is stated in the article at Nexia BT, large IT companies as Microsoft, Uniblue, GFI, Crimsonwing, RS2 and Anvil, Ixaris, HP and Oracle have already invested funds into the local IT sector in Malta. Lately it has been globally recognised that Malta is a prosperous hub for the IT sector, according to the research by Nexia BT. Malta is an appealing country to invest to offering flexible taxation and good opportunities to hire developers in Malta. CalvinAyre.com states that more than a hundred online gambling companies have set their businesses in Malta due to favourable conditions. The ICT industry in Malta has several niche areas of expertise including business information, computer gaming, online gambling, and technology, as Ecode states. They also state that Malta developers for hire are basically available due to the state programs recently introduced by MITA – the Malta IT Agency. Besides, skills of German and English languages are highly appreciated among developers in Malta as well. Malta is a favourable nearshore IT location for outsourcing among IT companies, as it is indicated in the article at NouvMT. European countries practice outsourcing business processes to Malta. The most popular processes outsourced are data processing, data storage, database management, disaster recovery etc. Times of Malta state that Malta is known as the European country with the highest share (63 per cent) of IT experts younger than 35. Maltese IT experts make 3.7% of the overall workforce in the country. Hiring a dedicated team from Malta does not appear to be a problem, because Malta is considered to have the highest proportion of IT graduates in the European Union in general as it is stated in the article in Times of Malta, which is almost 9% of those with tertiary education. However, as it goes in the article, nowadays IT outsourcing in Malta is limited by the number of appropriate qualified experts. Overall, IT companies in the country are growing, so the industry needs more qualified IT experts in various specializations. So 46% of Maltese companies who needed to hire IT experts, faced difficulties with finding appropriate qualified employees for their vacancies, Times of Malta writes. According to Forbes, every country has its biggest IT cities, Malta is not an exception. Valetta is the city with the largest number of local IT companies. On average, Maltese developers earn $ 30,550 annually, according to PayScale. A frontend developer gets $40,450, a software engineer earns $31,486, while an average annual salary of a senior software developer is $37,954. Payment rates for web developers in Valetta are higher due to the density of IT companies in the city. According to PayScale, a typical Valetta developer specializing in software development earns nearly $36,250. In comparison with the payment rates in Malta, Ukrainian wages of the highly qualified experts are much more comfortable. An average annual payment of a developer in Ukraine is $27,500, according to PayScale. It can be supposed that rapid IT sector development in Malta will lead to increase of the prices and developers’ rates in this industry making the outsourcing to Malta a costly idea. If you plan to hire Valletta dedicated team or devs in Malta, contact our Ukrainian remote developers first. Here at Mobilunity, managers will incorporate your inquiries and will find the best solution for outstaffing or outsourcing your IT project with the less expenditures. Mobilunity will provide a great team of dedicated developers for your project – give us a call right now!